“GEORGETOWN 2018 ARTWALK” LAUNCHES ON MAY 11, 12, and 13th. It is a Free Public Event over Mother’s Day Weekend. We will Celebrate the Cultural Arts with Art Exhibits, Concerts, and Kids Art Activities. 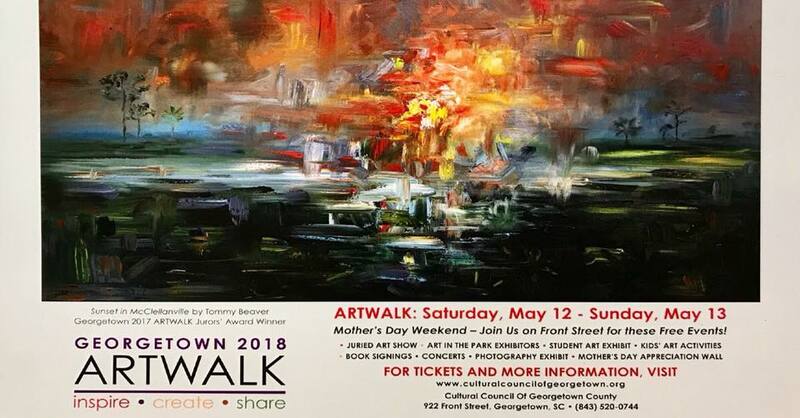 Come out and celebrate the arts in our community during “Georgetown 2018 ARTWALK.” View a wide range of juried artwork displayed in windows of businesses along Front Street in Georgetown’s Historic District. Browse the art by exhibitors in Georgetown’s Francis Marion Park. They will be showing and selling their work in a a wide variety of mediums, including paintings, prints, photographs, glass, jewelry, fiber art, and metal and woodwork. A special feature of the ARTWALK, now in its third year, will be voting for the People’s Choice Award, with designated locations for voters to drop off their ballots beginning at 5:00 p.m. on Friday and ending at 1:00 p.m. on Sunday. There will also be an exhibit of art by Georgetown County students at the Georgetown Historical Society and Museum; Kids’ Art Activities in Constitution Park from 10:00 a.m. to 3:00 p.m. on Saturday; and concerts in Francis Marion Park showcasing performances by The Morris Brothers Band, a rollicking Bluegrass Band on Saturday, and featuring the popular duo, Dan Sachs and Sallylu Sianni, on Sunday. The weekend’s events will begin on Friday, May 11th from 6 - 9p.m., with Winewalk this event is ticketed. You will be able to sample wine and view juried art in the stores along Front Street and a Last Call Party at the Cultural Council of Georgetown County, 922 Front Street. Tickets for this event can be purchased at CCGC.yapsody.com. A special feature of the ARTWALK will be voting for the People’s Choice Award, with designated locations for voters to drop off their ballots beginning at 5:00 p.m. on Friday and ending on 1:00 p.m. on Sunday.